Turnovers play a critical role in football. A tipped pass for an interception or crushing hit for a fumble can decide a close game. No coach emerges from a press conference without touting the importance of winning the turnover battle. However, not all turnovers are created equal. In the 2013 NFL regular season, teams with more interceptions than their opponent won the game 80% of the time. Teams that forced and recovered more fumbles than their opponents won the game 70% of the time. Interceptions have a bigger impact because the defender is most likely on his feet after the takeaway. This can lead to a big swing in field position or even a score. Defenders that recover fumbles tend to fall on the ball. What factors affect interceptions in the NFL? Here, we’ll look at the surprising analytics behind interceptions. You can do better than guessing that each team will throw picks on 2.9% of pass attempts, the NFL average. And it doesn’t involve an arcane statistic that comes from charting games. The critical numbers are in the box score, although it might not be the numbers you expect. We’ll also look at how this analysis changes the predicted point spread for a game. Seattle cornerback Richard Sherman led the NFL in interceptions in 2013. Despite all of his public claims about being the best cornerback in the league, Sherman credits his front seven for much of his success. Pass rush is an obvious candidate to affect interceptions. The more often a defense applies pressure on the quarterback, the more often he throws an errant pass. Or perhaps the defender strikes the quarterback’s arm, causing a wobbly pass to fall into the hands of the defense. To study this, we need to measure the strength of the pass rush. To start, let’s look at sacks, a number that requires proper context. A defense might rack up more sacks by facing more pass attempts. To account for this, let’s use sack rate, or sacks divided by the sum of pass attempts and sacks, as a measure of pass rush. To determine whether pass rush causes interceptions, consider NFL defenses in the regular season from 2003 through 2013. While I expected defenses with a better sack rate to have a higher interception rate, there’s no correlation between these two quantities for these 352 defenses. For those with a technical inclination, sack rate explains less than 1% of the variance in interception rate. For everyone else, check out the left panel of the visual in the next section. Richard Sherman might be a great cornerback because of Seattle’s pass rush. However, his pass rush doesn’t explain his high interception total in 2013. If pass rush has no effect on a defense’s interceptions, what about pass protection on offense? An offensive line that keeps pass rushers away from the quarterback might result in fewer interceptions. Over the same 11 regular seasons, the sack rate allowed by an offense explains 6% of the variance in the interception rate. 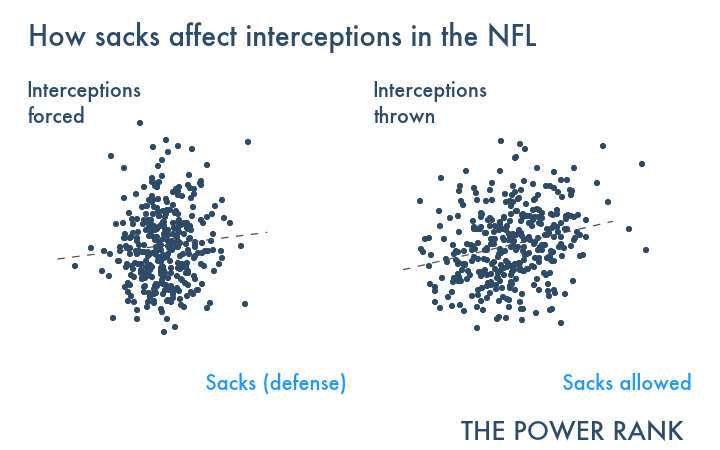 While this correlation is stronger than on defense, I still do not recommend using sacks to predict interceptions. The right panel of the visual shows why. We can dig even deeper into pass protection. Over the last 5 seasons, the NFL has tracked QB hits, or the number of times the quarterback gets hit after releasing the ball. We can now calculate the rate at which an offensive line allows the hits on the quarterback (the sum of QB hits and sacks divided by the sum of pass attempts and sacks). This QB hit rate gives a better perspective on pass protection. An offensive line might look good because of a low sack rate. For example, Indianapolis gave up sacks on 5.2% of pass attempts in 2013, 5th best in the NFL. However, this same offensive line allowed a hit rate of 23%, 26th worst in the NFL. Andrew Luck’s ability to get rid of the ball in the face of pressure played a big role in their low sack rate. The lack of protection probably also contributed to Luck’s below average completion percentage of 60% in 2013. However, even a better statistic like QB hit rate doesn’t correlate with interceptions. Hit rate explains 4% of the variance in interception rate, a weaker correlation than shown in the right panel of the visual. The data does not support the belief that pass rush affects interceptions. I would guess this comes from the ability of NFL quarterbacks to not let pressure to affect their accuracy. Of the thousands that play in high school and hundreds that make it to college, only 32 can play in the pros. These quarterbacks do not fold under pressure. However, these 32 quarterback do vary in their accuracy, and that might impact interceptions. Despite the wobbles of the his balls, Peyton Manning has shown incredible precision with his throws. Over his career, he has completed 65.5% of his passes. Of active players, only Drew Brees and Aaron Rodgers have a better career completion percentage. However, Peyton has gotten even better after having multiple neck surgeries. In his last two seasons with Denver, his completion percentage has increased to 68.4%. Do more accurate quarterbacks throw fewer interceptions? Any fan would rather have Manning and Rodgers leading their offense than Derek Anderson or Brady Quinn. But are fewer interceptions a consequence of a better quarterback? To answer this question, consider the career statistics for NFL quarterbacks in 2013 with at least 500 career pass attempts. The visual of these 52 players shows the negative correlation between completion percentage and interception rate. Peyton Manning is the third point from the right, and he has thrown picks at a higher rate than this regression analysis predicts. Aaron Rodgers has the lowest interception rate of the 3 quarterbacks with better than 65% completion rate. The outlier with the lowest interception rate is Nick Foles, the second year quarterback with Philadelphia. As much potential as he has shown, he will not continue to throw interceptions on 1.2% of his pass attempts. The same applies to San Francisco’s Colin Kaepernick, the point with the second lowest interception rate (1.7%). This correlation does not imply that better accuracy causes fewer interceptions. But this conclusion does seem logical. The quarterback has control over where he throws the ball. The more control he shows, the less likely the ball hits the hands of a defender. There are better ways to look at this causation, but they will have to wait for another day. For these quarterbacks, completion percentage explains 32% of the variance in interception rate. In the noisy world of football statistics, that’s as strong a relationship as you will see between two statistics. In addition, the correlation also exists for the regular season statistics of offenses from 2003 through 2013. Here, completion percentage explains 20% of the variance in interception rate. With this strong relationship between accuracy and interceptions, how can we modify a point spread prediction for a game? 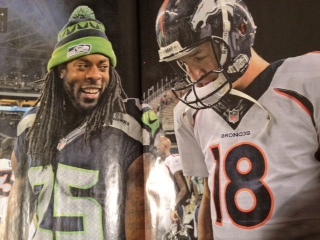 To use these results to adjust a prediction, let’s look back at the Super Bowl between Seattle and Denver at the end of the 2013 season. Before the game, the team rankings at The Power Rank predicted Seattle by 1.3 points, which implied a 46% chance for Denver to win. Denver had a lower likelihood to throw a pick based on Peyton Manning’s accuracy. On average, NFL quarterbacks throw interceptions on 2.9% of pass attempts. With Peyton’s 65.5% career completion percentage, the regression model predicted he would throw interceptions on 2.56% of pass attempts. For a league average 35 pass attempts, this meant 0.14 fewer interceptions for the game. While such a small fraction of picks might seem inconsequential, the impact of such a turnover makes it matter. From the relationship between interceptions and points in NFL games, the average interception is worth about 5 points. This changed the predicted point spread by 0.7 points in Denver’s favor. Seattle’s predicted margin of victory dropped from 1.3 to 0.6, which increased Denver’s win probably from 46% to 48%. The game didn’t go Denver’s way. Seattle’s defenders knew what mouthwash Manning used before the game since they spent the entire game in the backfield. Manning thew 2 interceptions. The first was an errant pass that landed in the hands of Cam Chancellor, a play in which Manning wasn’t pressured that heavily. The second pick came when a defender hit his arm on a throw. The football wobbled into the hands of Malcolm Smith, who ran for a Seattle touchdown. For the game, Manning thew 49 passes, so the two picks implied a 4.1% interception rate. Even with this small sample size, that is not an outrageous rate. If not for the bad luck on the pick in which his arm got hit, Manning would have had a 2% rate. Common sense says that pass rush and throwing accuracy affect interceptions. However, the NFL data only shows a link with one of these factors. If you want to predict interceptions, stay away from pass rush statistics and look at completion percentage. Would there be a correlation between yards gained rushing by the QB and a low interception rate? This might explain Kaepernick … taking off to run rather than make a bad throw? Yards gained rushing (or on scrambles with no passes available) probably says more about the running skills of the QB than the ability to avoid picks. I did look into sack rate for each QB’s, but I’ll have to save that for a different post. I have found that quarterbacks that tend to run the ball do have lower interception rates than would be explained by completion percentages. That is the case in college too. Tim Tebow, for instance, was not an accurate quarterback but he took off an ran the ball when he couldn’t find an open receiver rather than force a throw. That helps explain his low interception rate both in college and the NFL. So, I do agree with you that running quarterbacks tend to throw less interceptions than expected based on completion percentages. Thanks, Bob. We’ll see how Kaepernick does as his career continues. 1) Seeing the pressure and taking off running. 3) Seeing the pressure, waiting, and launching a ball downfield in play (with possible INT). 4) Not seeing the pressure and getting sacked (with possible fumble). Finding what stats best indicate these outcomes will be key to predicting INT rates with OL and opposing defense held constant. First off, thanks, because I always enjoy your columns. However, in this case, I would argue that completion percentage has two primary components: accuracy, as you mention, and offensive style, which isn’t mentioned. I suspect that the correlation between completion percentage and interception rate is actually as much a function of the style of passes that the offense attempts as the quarterback’s accuracy. In this case, the completion rate vs interception percentage chart would benefit from comparing similar throws, ie 0-10 yds downfield against 10-20 and 20+ or something similar. I feel like this might give you a better insight on the quarterback’s “accuracy” and that relationship to interception rate. For example, my perception is that the style of offense run by the Colts changed considerably this year compared to Luck’s rookie year. Would this style change explain more of the change in interception rate and completion rate rather than his maturity? RK, thanks. That’s certainly an angle to look at. I should have mentioned style of passes in the article. It clearly matters, but it’s hard to quantify without charting each play. I do think style of play matters even more in college than in the NFL. This is dead on. Comp. pct. is massively correlated to depth of target. Depth of target is correlated to INT rate. Therefore, it’s not surprising (though not necessarily causal) that comp. pct. and INT rates are correlated. Great article! Will you be incorporating this info into your rankings and win probabilities? What about Russell Wilson… you got one of the 2 QB’s in the game.. Which data point is he and how does that change the predicted MOV? Wilson is at 63.6% completion percentage. Pretty close to league average with not a ton of attempts, so we’ll stick with 2.9% pick rate for him. His actual pick rate over 2 seasons has been 2.4%. 1. Pass Efficiency sorts teams (probably) better than any single stat. 2. INTs define winners and losers in any individual game more than any single stat. So, what is the grease in the system? What makes teams “win” in #1 and #2, holding the variable of QB ability and just-plain team ability constant? Something, in the running game, by my guess. Otherwise, we are in Dr. Ben Alomar’s world, where a team should never run the ball because YPPA is greater than YPRA. But that’s why we hired you, Dr. Feng. To unlock these secrets; the unified filed theory of football. Thanks, Craig. My goal is to fill in the holes of your unified theory. Just did a quick check, and there’s no correlation between rush yards per carry on offense and their interception rate. I would add, that anecdotally, it seems that a large percentage of picks occur at the end of games when teams are behind by 2 or more scores late in the 4th quarter. For instance if you are behind by 10 with 3 minutes left and only one or two TOs you have to air it out, get one quick score, then go for the onside kick. Since there is nothing to lose quarterbacks will naturally take more calculated risks, but unfortunately for them they do so either against prevent defenses or heavy pass rushes in the face. TOs that occur under those circumstances would seem to be mostly irrelevant in charting picks under normal game circumstances. Therefore the factors you previously analyzed might become more relevant if you can eliminate games where teams lost by say 9 or more points. Marc, another great point. Brett Favre would throw into triple coverage for the 1 in 1000 chance to get a touchdown to save his team. Yet he didn’t throw that many picks when his team was good. I wouldn’t eliminate games in which a team lost by more than 9 but just not count those late game picks, something one can do with the play by play. Eyeballing the main chart, it looks like the rate of interceptions on non-completed passes doesn’t really vary much across completion rates. In other words, if a pass isn’t a completion, then it has roughly a 1 in 13 chance of being an interception, no matter who threw it. Great question. I think it’s high. But sacks are rare, so even if fumbles on sacks are more likely, I’m not sure about the total impact. I really enjoyed this article. The one thing I found odd is that you were using sack rates rather than QB pressures to monitor a pass rushers effectiveness. What was the rationale for picking sack rate over pressure rate? I found the pressure rates for offenses (data on QB hits) but not defense. Kick nfl.com in the pants, and I’ll include the pressure rate for a defense. Is there a stat that measures how often the defense gets their hands on the ball beyond the line of scrimmage or how well covered the defense plays the receivers? That could be a measure of how tight the coverage is and that might predict interceptions. 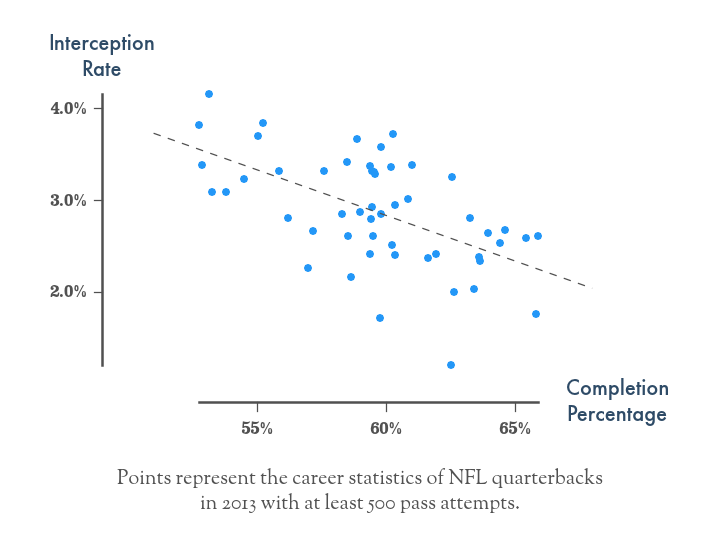 Another thing that might predict interceptions is qb arm strength + qb accuracy. The faster you throw the ball the less time the defense has to maneuver and then intercept it. Also, many interceptions are on underthrown balls which more arm strength would address. Does ball speed or arm strength predict interceptions? Another one is release speed. The faster your release the less time the defense has to read it and INT. 4. Type of route the receiver runs – long or short – in or out. It also seems that the type of throw might impact the interception rate. For example, deep throws probably have a higher interception rate than short throws. A slant would be different than an out. You could adjust the QB’s INT rate based on his throw difficulty. You’d have to create a throw difficulty index of course if one did not exist. I would also say that throw difficulty might play a lot into the QB completion percentage. A crude throw difficulty index would be the QB’s average throw distance minus RAC (run after catch). Another thing that might predict INT’s is more of an in-game phenomenon. If your team is behind at the end of the game (or way behind early in a game) and you must get a TD to win, you are going to take a risk on an INT. In fact, hail mary’s often end in INTs. So a pregame stat that might predict interceptions is the likelihood of your team being behind. In thinking about end of game interceptions such as 60 yard heaves with 2 seconds left, those aren’t really the quarterback’s fault. They should be taking the risk of an INT. If possible, any search for factors that predict INTs should be done with those INT’s removed. They are really a totally different INT – a punt would be more accurate than calling them an INT. Finally, I see interceptions where the defender out-jumps or outmaneuvers the receiver. So the size or height or speed or jumping ability of your receivers relative to the same of the defending receivers might predict INTs. However, this might be captured in the receiver’s interception rate provided receivers have been thrown to enough to have an interception rate. Any of these sound plausible? Eric, you touch on some good points. Unfortunately, we need video tracking technology before we can answer some of your questions!! There’s a trivial linear relationship between completion percentage and interception rate because every interception is an incomplete pass. By definition, compl% = 1 – int/att – nint/att (where “nint” refers to non-interception incomplete passes). I would suggest seeing if there is a linear relationship between int/att and nint/att.